I think this episode's information confused fans a bit. How could Daisy, Annie and Clarabel interact if the railcar was sent to the new Harwick branch with Ryan at the end of Sodor's Legend of the Lost Treasure? Well, now we know. But will The Railcar and the Coaches be any good? I honestly thought that Daisy had been forgotten about after Calling All Engines!. The fact that she was used there, then instantly dropped, was really disappointing. And the less said about the way Britt Allcroft treated her, the better. And then Sodor's Legend of the Lost Treasure came along. Yes, it was a few seconds of fan service, but it raised my hopes that finally someone had come along to treat her right and actually give her some attention. The fact that she was on the Harwick extension with Ryan was a bonus as it meant that she wouldn't be overshadowed any longer. To my absolute delight, this episode proved that my faith in this team was spot on. Sure, episode quality has been inconsistent this year, but they've never gone wrong with the classic characters they've brought back, and Daisy is no exception. From the first shot she's in, you can tell immediately that she's rather arrogant and snobby, and as the episode progresses, it's portrayed perfectly how snobby she can be. It's absolutely fantastic, and highly entertaining. Oh, and can I just say that Tracy-Ann Oberman was the perfect casting choice for her? She nails the character beautifully, and her performance makes the whole episode a joy to watch. I honestly don't think anyone else could've voiced her as well as Tracy Ann did, and I'm excited to hear more from her in the future. Surprisingly though, the characters that stood out alongside Daisy were Annie and Clarabel. I said that Over the Hill was an episode I didn't know I wanted until we got it. Well this version of Annie and Clarabel was also something I didn't know I wanted. But now we have it, I want more. We've seen so often throughout the years how much of an influence they are on Thomas, so to see how much he has influenced them was brilliant. It gives the coaches a bit of depth and, again, I'd love to see more (if they can find another way to bring this side out of them). It was also rather refreshing to see rolling stock punished for once. I don't think we've seen that since Toad Stands By, and even then S. C. Ruffey was rebuilt at the end of it (which is a stupid ending if you consider the original, but I digress). I know it was to be expected - characters usually do get punished for their misdemeanours these days - but you never really imagine coaches misbehaving and being punished for it. Also, that ending will never not be funny. 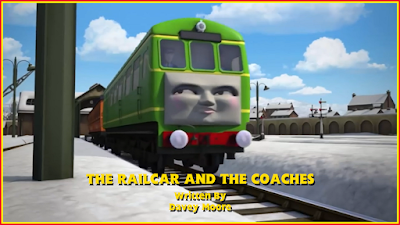 Whoever thought it was a good idea to have the two coaches pulled by Diesel is an evil genius and I love them for it. It was so unexpected in all the right ways, and his line was delivered brilliantly. I wasn't really sure about Kerry Shale voicing Diesel when he debuted in Tickled Pink, but now I can't imagine him being voiced by anyone else. He gets the character so well (and Sharon Miller's voice directing helps). If I had to pick a flaw, it's probably with the moral. Don't get me wrong, it's a very good moral and it was executed well, but... it's nothing new. Granted, it's not as abused as much as the "work as a team" one, but it was still used in Thomas & the Emergency Cable two years ago. Considering they did what they could to make it feel fresh and different though, it's a huge nitpick. #S20XmasRailcar Daisy was awesome and coaches being in trouble with TFC was a breath of fresh air. An alright episode. When the only drawback I can think of is "the moral's been done before", they've done something right. The episode was an absolute joy to sit through. The characters were fantastic, the moral was still great (and was executed in a unique enough way from Thomas & the Emergency Cable) and the ending is one of the funniest of the show. I really couldn't ask for more. It was a terrific return for Daisy and I hope the team do more with her in the future.